The Dallas Rhino Meeting brings top rhinoplasty surgeons from around the world to this annual meeting which is dedicated to the advancement of safe and effective rhinoplasty. Dallas rhinoplasty surgeon, Dr. Rod J. Rohrich, will be hosting the 36th annual Dallas Rhinoplasty Meeting. The Dallas Rhinoplasty Meeting is a hands-on global meeting where participants can see, learn, and perform rhinoplasty alongside leading rhinoplasty experts, some that pioneered modern rhinoplasty techniques. Dallas rhinoplasty surgeon, Dr. Rod J. Rohrich, will be hosting the 36th annual Dallas Rhinoplasty Meeting. The annual conference, which is attended by rhinoplasty experts from around the world, will take place from March 22nd and 23rd. The meetings cover a wide range of topics from the fundamentals of nasal anatomy to complex surgical procedures and detailed analysis of revision rhinoplasty. Formats include lectures, discussion panels, video review, Q&A sessions, and also feature a unique, anatomy lab which is a key feature of the meeting. Over its 36 year history, the Dallas Rhinoplasty Meeting has become a key international event for surgeons worldwide as a unique educational venue for sharing the latest techniques and advancements in rhinoplasty. 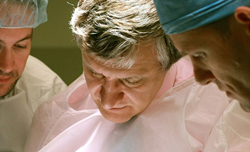 The meeting has brought about crucial shifts in the field such as the widespread adoption of the "open approach", which is now considered the primary method for performing rhinoplasty surgery today. The meeting also inspired the textbook "Dallas Rhinoplasty: Nasal Surgery by the Masters," now it is 3rd edition edited by Drs. Rohrich, Adams, and Ahmad and is used as the rhinoplasty textbook in plastic surgery educational programs internationally. "The Dallas Rhinoplasty Meeting is a hands-on global meeting where participants can see, learn, and perform rhinoplasty alongside leading rhinoplasty experts, some that pioneered modern rhinoplasty techniques," explains Dr. Rohrich, the Meeting's Chairman. "The meeting is significant in that many renowned rhinoplasty surgeons gather together and discussion focuses on what works to provide optimal, long term results." Over the past three decades, the Dallas Rhinoplasty Meeting has trained over 5,000 plastic surgeons and otolaryngologists. "The Dallas Rhinoplasty Meeting continues to be an important educational venue for surgeons who want to learn and truly master rhinoplasty surgery," says Dr. Rohrich. "Rhinoplasty truly epitomizes plastic surgery as a whole because it is a surgery of such great finesse and takes years to master," says Dr. Rohrich. "It is one of the most difficult procedures in all of plastic surgery, but also one of the most rewarding."